The Villanova Wildcats make their way from the Main Line to Lincoln Financial Field for the inaugural Mayor’s Cup. The Wildcats enter the season ranked No. 4 in the Bowl Subdivision. Slightly less than six years ago, Sept. 6, 2003, to be exact, the Villanova Wildcats football team emerged from the brand-new Lincoln Financial Field locker room and lined up against an Owls squad that finished 4-8 the year before. 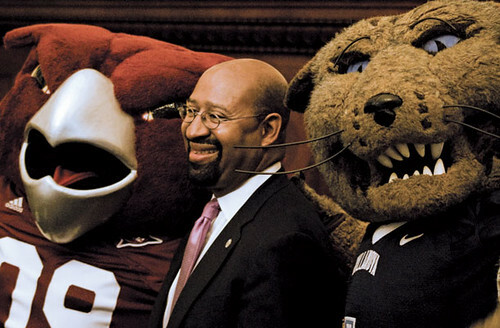 Mayor Michael Nutter toes the line between Hooter the Owl and Will D. Cat, refusing to choose a side in the Philadelphia-area matchup Thursday. Villanova beat Temple the last time out, the Linc’s debut season. The Wildcats, then a member of Division I-AA, had just defeated a Division I-A team like Temple the year before with a 37-19 win over Rutgers. That marked the first time Villanova defeated a Division I-A opponent since re-establishing a football program in 1985. On that Saturday afternoon in 2003, Villanova did it again, beating Temple, 23-20, in double overtime. The week before that Wildcats-Owls football game, Temple lost at Penn State, 23-10. This year, the Owls head to Penn State after playing Villanova. The Wildcats enter the Mayor’s Cup matchup picked to finish in a tie for first place with Richmond in the Colonial Athletic Association. A preseason poll by AnyGivenSaturday.com ranked Richmond the No. 1 Football Championship Subdivision team in the nation, with Villanova close behind at No. 4. The Wildcats finished 7-1 in the CAA last season and 10-3 overall, losing to James Madison in the NCAA FCS quarterfinals. “They won 10 games last year, which is about as much as we have had in the past four years, and they’re expected to vie for a national title,” coach Al Golden said. “Of course it’s a dangerous game,” Bradshaw said. “Villanova’s ranked one of the top institutions in the country in their division. They’re a very formidable opponent. There were much easier games that Temple could have played. Division I-AA teams do beat Division I-A. There isn’t that much difference between the best teams in Division I-AA and the second half of I-A. Temple and Villanova started discussing a long-term agreement to play football at the Linc about two years ago, Bradshaw said. As the only two scholarship football programs in the Delaware Valley and as Big 5 rivals, they worked out a contract that has the two teams opening each other’s seasons for each of the next four years. After 2012, Villanova has other scheduling commitments, so Bradshaw said Temple may look into playing another CAA opponent – Delaware. The Mayor’s Cup name came about after the two universities scheduled the four games. Mayor Nutter spoke to the football team about two years ago, Bradshaw said, which was when the marketing ploy first surfaced. Barring any unforeseen emergencies, Temple officials expect Nutter to attend the game and present the winner with an engraved trophy. Bill Cosby will handle the coin toss. Fifteen starters return from last year’s Villanova squad, including junior quarterback Chris Whitney and junior running back Aaron Ball. Whitney completed 120 of 174 passes for 1,448 yards and 10 touchdowns last season. He also rushed for 467 yards and four touchdowns. Bell’s 1,081 yards in 2008 marked only the third 1,000-yard rushing season in Wildcat history. He scored a team-high 13 touchdowns and averaged 5 yards per carry. Even junior wide receiver Matt Szczur, who caught 32 passes for 511 yards, rushed for 449 yards on 78 carries. The Wildcats lost two starters on the defensive line, but senior Osayi Osunde leads the linebacking core. Osunde, a first-team CAA selection, had 75 tackles, including five for a loss, two interceptions and two forced fumbles last season. Villanova holds a 15-12-2 all-time edge against Temple. Jennifer Reardon can be reached at jennifer.reardon@temple.edu. Brian Dzenis contributed to this article and can be reached at brian.dzenis@temple.edu. The Buffalo Bills selected former Temple left tackle Dion Dawkins with the 63rd overall pick in the NFL Draft on the Benjamin Franklin Parkway on Friday.